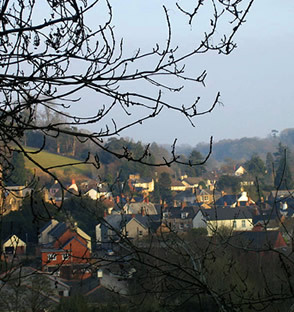 Dulverton is a thriving small town in the heart of the Exmoor National Park. The construction of Dulverton has changed little over the years. We have a variety of shops, offering an excellent choice of merchandise. We have two central Pubs, The Rock and The Bridge, The Lion Hotel and a number of Guest Houses in the area including our own. This is very much a living town with two schools and all the amenities that one would expect from a small rural town in the heart of the Somerset countryside. Walk into our Information Centre and find endless points of interest that will take you on expeditions all over the Moor. The river walk from Dulverton to Tarr Steps is about 7 miles each way, but well worth the effort. The Caravan Club has an excellent site behind the Exmoor National Park’s office and a new site at Exebridge. Our town’s museum is also well worth a visit and will take you back through Dulverton’s history. On the first Sunday of December, from 12 noon until 7pm, Dulverton celebrates the coming of Christmas. With a host of special events and with most businesses staying open throughout the celebrations, Dulverton is alive with activity. From Carol singers to Brass Bands and not forgetting our most important visitor, Father Christmas! The event is sponsored by the Town’s business community, of which Tongdam plays a central part. Watch out for the Tongdam Raffle which supports the Starlight Project. At dusk, Dulverton sparkles with thousands of white lights that adorn Christmas Trees of all shapes and sizes throughout the town.